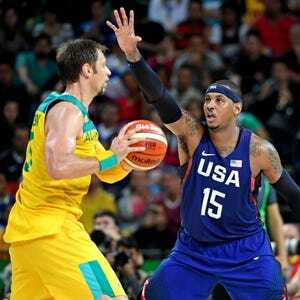 Team USA star Carmelo Anthony spoke with USA TODAY Sports about his Monday experience visiting a Rio de Janeiro favela. RIO DE JANEIRO — Carmelo Anthony had seen what favelas looked like in the movies. Or, to be more accurate, the movie. For a few hours on Monday, he was one of them too. The Rio slums that were a character all their own in the celebrated 2002 film have been a topic of great discussion at these Olympics. Amid all the pomp and unfortunate circumstance that comes with the Games, from the newly built stadiums and arenas to the approximately 60,000 people who were displaced to hold them in this poverty-stricken city, the crime-ridden favelas are widely known as the place all visitors must avoid. Many favelas are ruled by drug lords, with local police having only intermittent control and others, like the one Anthony visited, monitored by the Pacifying Police Units (UPP in Portuguese acronym). This particular neighborhood, which sits between the Christ the Redeemer statue and the breathtaking Sugarloaf Mountain, was once known as one of the most violent around before there was improvement in recent years. According to CBC News, however, there was a spike in crime from muggers and thieves leading up to the Olympics. Yet strangely, it remains a tourist site of sorts: According to the March article in CBC News, there are 10,000 visitors to the favela per month. According to TripAdvisor.com, it ranks No. 22 of 342 tours in this beautiful, troubled, complicated city. Naturally, Anthony decided to head that way. The trip, which Anthony said was organized just over a day before it all unfolded, was consistent with his recent personal theme. Anthony, who has been active in speaking out about the Black Lives Matter movement and recently led a town hall in Los Angeles to discuss such matters with community leaders and police officers, is fast becoming the NBA’s most influential social voice. But this visit came with one concerning disclaimer: there was no security detail allowed. Ironically, Anthony’s visit took place a day after American swimmer Ryan Lochte was robbed at gunpoint in Rio while in a taxi. “We couldn’t really bring the security,” Anthony said. “The police really wasn’t around. I had people with me, but you had to really trust the people who run that community. Still, Anthony explained, a connection had to be made with the locals before they could all relax. Many people, kids among them, did not want to be filmed. “It’s the favelas,” Anthony said. “Everything that happens in favelas stays there. It was more about putting them at ease, making them feel at peace, and kind of settling that tension. When I walked in there, I went straight to the people who I was supposed to go to and talked to them and let them know what I was doing and what I was about. Why is the U.S. men's basketball team struggling in Rio Olympics? The highlight came near the end of the trip, when Anthony’s time there was memorialized in a way he never imagined. One of the artists who works with the local children decided to spray-paint a mural of Anthony on a concrete wall that stands on the favela hill. Long before Anthony’s visit, Michael Jackson came to Santa Marta with director/Knicks fan Spike Lee to film a music video for the song, They Don’t Really Care About Us in 1996. After he was gone, they built a statue of the iconic singer and painted a mural.